This is a still/shot with a short video movie that my friend Pam Brock made. She came last fall and spent an afternoon in the studio while visiting another potter friend and firing a kiln. I showed her a technique for throwing goblets in one piece. Originally I got the idea from a Cynthia Bringle workshop I attended about 8 years ago. She was throwing water tumblers with an open bottom and using a ball of clay to plug the collared-in top. When I had to make some goblets for a commission, I tried that technique but all 12 of them cracked. Which just goes to show you that another person's technique, clay glazes and firing may not work for you, your clay or your kiln. I violated the basic rule of "TEST, TEST, TEST". But I was not ready to give up, thought about it alot and had a brainstorm. I would try a "cookie" of clay instead of a ball of clay. I only made 2 this time. The cookie worked really well as long as I made them fresh (still pliable and not stiff) and I put a hole in the stem to keep pressure from causing the joint to crack. Hope you enjoy. I do trim freshly made, wet goblets on the wheel to reduce the bulk of the stem and refine them. These are more on the line of chalices, and receive a lot of carving when leatherhard. Thanks Pam for the editing and the movie! The work on the red shutters and garden area has ceased for the moment. 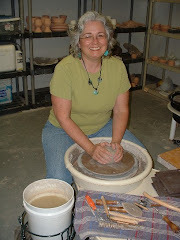 My newest, non-pottery making venture was to rearrange the throwing studio so that I could elevate my wheel. Before all organization is a moment (or in this case, many days) of chaos and confusion. Right in the middle of it I was wondering why. However, cleanliness and order has been restored and I will be able to start throwing again on Monday. In case you were wondering, this is not the organzied version. That photo will follow next week. I had to crawl into the car after finishing Friday, with no energy left to document the labor. He was very excited because they had a full page article in a magazine called REAX, and they have been working on new music for the next full length cd. It's really amazing to watch your grown children with all their accomplishments. He's the third guy from the left in the pix. I was thrilled to be included in the book, Homegrown Handmade Art Roads and Farm Trails. It's a really cool touring book that gives you different trails to see artist studios, farms, galleries, etc. I think it's a great way to discover all the cool stuff in your own backyard. A "Daytripping" kind of thing where you can stay close to home but feel like you've had a mini-vacation in this new age of expensive gas. Note of frustration: You won't be able to get there from my link above. Tried about 10 times to get the link to work, but to NO AVAIL. Sometimes these computers drive me freakin crazy! It could also be because I worked for hours on end last night and some this morning on the postcard design for the Carolina Pottery Festival and my patience is nonexistent at this point. Time to go make some clay and gain that equilibrium back. to see the book, or look at Amazon online. Sorry for the long silence, however, we were out of town on family vacation and no internet! Will post pictures from the new camera soon. I have mastered regular shots and even a small video. We had a great time with Jim's family and our children all made an appearance, which was wonderful. Played some dominos and some wickedly serious Charades and there was much eating, swimming, etc. I'm setting up a new blog, but not for me. It's for the Carolina Pottery Festival. I have found I can manage the blogs much easier than changing a website. If you want to see it in the works--as in, I am still working on it and it needs a lot of info--go to www.carolinapotteryfestival.blogspot.com. I am one of the Board of Directors for the festival and have done the promotion and marketing for it since we started in in 2001. If you know anyone who is a pottery lover, please pass on the info. This year's festival will be on Nov. 8, 2008. For those interested souls, I did decide that the red shutters would be beautiful and now they are finished and hung. Images to come in the future. These are the colors for a custom dinnerware set. I am waiting to see if the large plates warped too much. Cooling in the kiln as we speak. If they did, it is back to the drawing board, but the small plates and bowls are done. Yeah! These are the finished sumi-e dishes. I am growing more fond of them and have set them in a spot in the studio so they surprise me and I have to really look at them for what they are. I am still painting the shutters red and working on artwork for the door, but did get some finished work out of the kiln and have some more to come out today. Jim was very happy with the plates I made for him. I couldn't keep it a secret any longer, so had to show him. They have all the warm tones he likes and it reminds me of what I think Tuscan colors looks like. Well, I didn't get pictures done because the kiln took a very long time to cool and by the time I unloaded and reloaded it, I was beat. My friend Ron talked about having to be a plumber and there were several comments on his blog about what a jack of all trades a potter has to be. Today I was the painter, the go-for, the landscape person and the handyman, and I managed to make a few pots. Here is what is going on: We had the trim on the building painted a few weeks back and I have stewed over whether to paint the shutters. Once I decided "yes", then it was "what color?". I even went so far as to take some old paint and paint foam core board and stick it outside to see if I liked it against the brick. So today I made the big leap and bought red paint, as in Ruby Red paint. I took down one of the shutters and hauled inside to try it out. In the middle of the first coat I was having a rather desperate conversation with myself, because I was saying "Surely it will dry darker than this" and "I did buy paintable shutters before, didn't I?" as the color was very dramatic in the paint can and seemed to want to slide off the shutters instead of adhere. By the end of the evening it did seem to be a bit darker and was drying, so maybe there is hope. I also wanted to have a painted decoration framing the front entrance that would have vines with teacups and teapots and mugs and plates sprouting off of it and the background would be the color of the trim, so I had lumber cut and started priming it. Landscaping was pulling up the rest of the weeds in the bed where we pulled up the knarly looking privet hedge and spreading out 10 bags of mulch. I am sure it was a comic sight to anyone on Hwy. 74 around 4:00 pm today. On the kiln front, the sumi-e plates were not exactly what I thought, but I did like the plum branches. My favorite before they were fired was the Chinese lanterns, but there wasn't enough yellow underglaze for me. I will have to mull on them awhile, letting the reality and the vision settle down together. I will try it again but will use a clear glaze over them as the subtle amber was so subtle you can't really see it. I have a few more ideas to work on this little series. Had some warpage on the large handbuilt plates for the dinnerware set. Don't know if it is the glazing or the drying, but will attempt another firing on Monday. Maybe photos will follow tomorrow if I can work photographer into my job descriptions. My grandmother used to say "Now we're cooking with grease!" when she wanted to make a point that things were really heating up and getting busy. Tonight I'm cooking with electricity--the kiln will be going in several hours and on Saturday I hope to open and see some great sights. I have a portion of a dinnerware set and the three sumi-e pieces in this load. I got a little nervous when glazing the sumi-e work. Had big ideas about doing three different transparent glazes but chickened out and stuck to one, although it is a new combination that I hope will give a very subtle amber. I'm not believing the difference in temperatures that we have had the past week. The kiln was registering 105 inside, and it hadn't been fired. The dinner set I am making for Jim for Pop Day is turning out very nice. Will try to shoot some shots tomorrow of the plates and also of some great little flower containers I did recently. We finally got the Tides of Man cd's from Spencer. It was very moving to see the finished product. Will write more about that later. Off to dinner! Very interestingly I was reading a little article about when you lose your sense of wonder and delight in the world, it is the beginning of the death of your consciousness and awareness and when I got to work, a dragonfly was waiting for me. I can't say I have ever met one before in person, but this one lighted on my arm as if it knew me. The colors of it's long body were an iridescent blue and turquoise and it looked at me with it's huge eyes and I didn't know quite what to do. So I decided to bring it in and take a picture and it was most co-operative. After the pictures, I released it outside and haven't seen it since. Very strange, but delightful. Yesterday and today I have been working with reclaim clay. I do a very low tech reclaim by throwing it in a bucket, adding water and then aging. It usually ends up being very soft and very saturated clay. It takes forever to dry. I would imagine it shrinks more than usual, too. But it always feels good to empty one of the myriad of buckets hanging around the studio. Got the new Ceramics Monthly and enjoyed several articles on A Potter's Life. One of the things that has been on my mind is how to work around an aging body. I have been experiencing some hip soreness and experimenting with different throwing positions. The only sure thing that works for me is to get up lots, stretch and alternate tasks so I am not standing or sitting for extended times. Watched a lovely movie called SILK, a period piece about the silk trade, silk worm eggs and Japan. The scenery was incredibly beautiful.